Blackpool FC are set to return to Wembley this Sunday in the League Two play-off final against Exeter City. 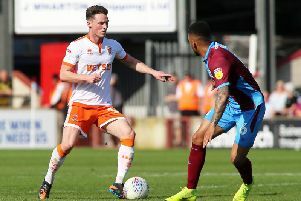 After a dramatic late goal saw them go through to the final 6-5 on aggregate, the Seasiders now look to make an immediate return to League One football next season. To mark the occasion, leading Lancashire bookmaker BetSid is offering readers a fantastic £5 free bet on the first goalscorer in the match. Simply cut out the coupon in The Gazette on Thursday and Friday (May 25 and 26) or in this week’s Lytham St Annes Express and take it to any BetSid shop to place your £5 bet completely free! Voucher entitles the user to one £5 single on the first goalscorer during the 2017 League 2 play-off final. 90 minutes play only.